Background : Stress has been found to significantly reduce the abilities of the immune system to fight infections. One of the ways to overcome the defects of the immune system is the strengthening of the defense reactions by nutrition. Aims : To evaluate immune enhancing effects of the following material: WB365, a novel combination of Ashwagandha (Withania somnifera) and Maitake (Grifola frondosa) extracts. Results : We found that both glucan-rich maitake extract and WB365 caused a similar stimulation of phagocytic activity. Stress-induced increase of corticosterone production was blocked by feeding with Ashwagandha extract and even more by WB365. Cytokine experiments showed that feeding with WB365 helped overcome the stress-related inhibition of IL-6, IL-12 and IFN-γ production. 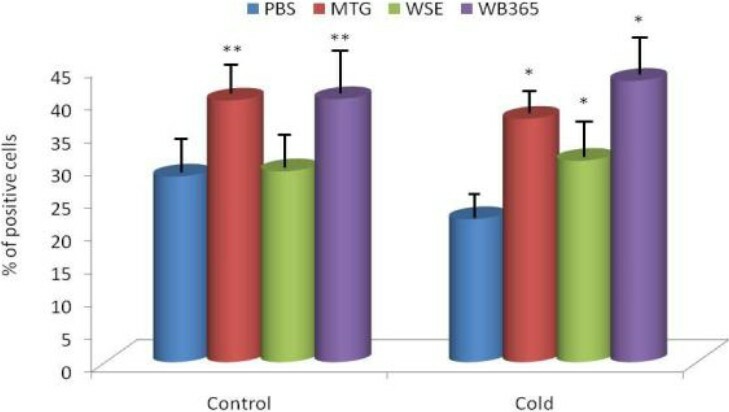 Conclusion : This study clearly demonstrated that WB365, a combination of Maitake mushroom-derived glucan and Ashwagandha extracts, has strong pleiotropic biological effects related to immune health and stress reduction. Background: Lamivudine and artesunate are sometimes co administered in HIV-malaria co morbidity. Both drugs are used concurrently in presumptive malaria treatment and simultaneous HIV post exposure prophylaxis. Aim: The aim of this study was to investigate the effect of lamivudine-artesunate co administration on the histology of the liver of diseased adult Wistar rats. Materials and Methods: Five groups of rats of both sexes were used for the study and placed on feed and water ad libitum. Disease state consisted of immunosuppression with cyclophosphamide, and infection with Plasmodium berghei. Group 1 animals served as vehicle control, while group 2 were the diseased controls. Group 3 animals received 20 mg/kg lamivudine for three weeks, while group 4 similarly received 20 mg/kg Lamivudine but also received 10 mg/kg artesunate from day 12. Animals in group 5 received 10 mg/kg artesunate from day 12. All drugs were administered intraperitoneally. The animals were treated for twenty-one days, at the end of which they were sacrificed and their livers fixed in 10% formalin for histological studies. Result: Results from the study show the presence of regions of focal necrosis and perivascular cuffing with animals that received artesunate. 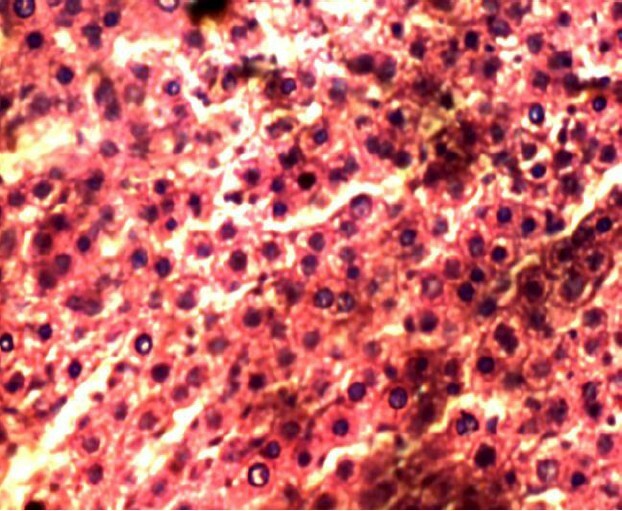 Hemosiderosis was a common feature in all the parasitized groups, while fatty degeneration was observed in the group that received artesunate alone. Conclusion: Concurrent lamivudine-artesunate administration resulted in some histopathological changes in the liver. This study suggests there may be considerable histological changes with repeated occurrence of malaria and immunosuppression that may warrant intermittent lamivudine-artesunate administration, and may require evaluation as well as monitoring of liver function during such therapeutic interventions. Background: Every year, millions of people are exposed to avoidable, life-threatening risks through the trans­fusion of unsafe blood. 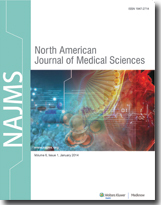 Aim : To determine the survival time of Treponema pallidum in banked donor blood. Material and Methods : Two groups of male Wistar rats (group A and B) were inoculated intratesticularly with 0.5ml of artificially infected donor blood (final density of Nichols treponemes: 5x10 5 /ml) stored at 4 o C for various periods of time. In group A, a pair each of the rats was injected every 12 hours, starting at 0 hr, up to a maximal storage time of 96 hr. In group B, the rats were injected after 72, 120, 192 and 336 hours of storage of the treponemes-blood mixture. Group C which is a control group was injected with blood only, while group D rats were injected with heat-killed treponemes suspended in blood every 12 hours. The detection of Treponema pallidum IgG/IgM was based on the principle of double antigen sandwich immunoassay, in which purified recombinant antigens are employed sufficiently to identify antibodies to Syphilis. The outcomes of interest included the proportion of Syphilis positive rats and the maximal survival hours of T. pallidum in banked blood. Results : 14 rats (77.8%) out of the 18 rats that were involved in group A developed orchitis and positive serology up to 72 hours of storage time, p<0.05. 2 rats (25%) in group B developed orchitis after 72hrs of storage time. All the 18 rats (100%) in the control group C and D showed neither clinical nor serological changes. Conclusion : It was concluded that the survival time of T. pallidum in banked donor blood lies between 72-120hrs in this study. Regardless of blood banking temperature, T. pallidum and other transfusion transmissible infections should be screened for prior to allogeneic transfusion. Background : The first issue of this series proposed extrapolation chart with conventional reference range and suggested comparison of results with other methods. Aim : This work sets out to compare interpretative results from the extrapolation method with those from a digital viscometer method. Materials and Methods : Five cases in our archived clinical pathology database that were specifically tested for whole blood viscosity by the digital method, and had results for haematocrit and serum proteins were pooled. The values of haematocrit and serum proteins were used to derive extrapolated values. The interpretative results of the extrapolation method were compared with those of digital viscometer-based clinical reports. Non-Newtonian fluids such as whole blood have different viscosities at different shear rates. Comparative statement can only be based on interpreted outcome. Results : Two-fifth absolute concordance and one-fifth discordance is observed between extrapolation and viscometer-based clinical reports. The discordance is a case of hyperviscosity in the presence of neither hyperproteinaemia nor polycythemia. Conclusion : The extrapolation method may underestimate whole blood viscosity in some patients when compared with digital viscometer, which in turn may suggest hyperviscosity that cannot be explained by hyperproteinaemia or polycythemia concepts. The impact of oxidative stress is highlighted. Context: Ganglioneuromas are benign tumors of the sympathetic nervous system that rarely arise in the adrenal gland. Majority of cases are detected incidentally since they are usually asymptomatic. Up to the current era of laparoscopic adrenal mass excision, this unusual entity has not been adequately reported in the surgical literature. Case Report: A 51 year old male with history of hypertension was found to have abdominal bruit during a regular physical examination. A 4 cm right adrenal mass with upper pole calcification and a 6 cm retro-pancreatic mass were subsequently found on a computed tomography scan. Endoscopic ultrasound-guided needle biopsy was indeterminate. Preoperative endocrine evaluation showed mildly elevated vanillyl mandelic acid with normal 24-hour cathecolamine, metanephrine and cortisol levels. Histopathologic examination after an uneventful laparoscopic excision was consistent with ganglioneuroma. Conclusions: Ganglioneuroma occurs rarely in adrenal gland and preoperative diagnosis is difficult since symptoms are usually nonspecific. Due to widespread utilization of abdominal imaging, however, it should be included in differential diagnosis of adrenal or retroperitoneal mass. Histopathologic examination is currently the mainstay of diagnosis. Context: Surgical instruments and materials continue to be retained in the peritoneal cavity despite precautionary measures. Even though uncommon it is also under-reported and carries serious medico-legal consequences. Gauzes and sponges (gossypiboma) are the most commonly retained materials and intra-abdominal retained artery forceps are much rarer but when they do occur lead to chronic abdominal pain and can be a rare cause of intestinal obstruction or strangulation with significant morbidity and mortality. 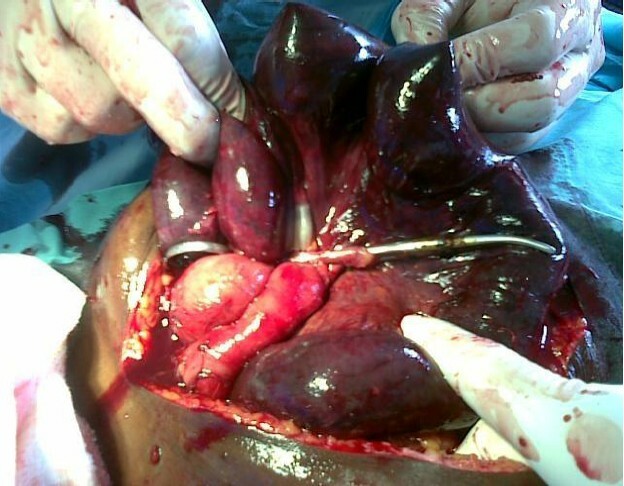 Case Report: We present a case of intraabdominal retained artery forceps in a 70-years-old lady who underwent laparotomy with splenectomy for a large spleen in a peripheral hospital. Upon discharge she continued to complain of intermittent abdominal pain of increasing severity. 12 months later she presented to us with an acute (surgical) abdomen requiring another laparotomy. At laparotomy she had strangulated/gangrenous lower jejunual and upper ileal bowel loops, the small bowel mesentery of this area being tightly trapped between the jaws of the retained artery forceps. She had gut resection and enteroanastomosis. Unfortunately she died from continuing sepsis on the second post-operative day. Conclusion: Retained instruments in intra-abdominal surgery can cause serious complication and should be treated surgically. High index of suspicion and appropriate investigations like plain abdominal X-ray, abdominal ultrasound and CT and MRI scans should be instituted in patients who develop chronic abdominal symptoms following laparotomy. Preventive measures against retained instruments must follow strict laid down protocols for surgical instruments handling in theatre. Background: The oxidative stress is considered as major consequence of diabetes mellitus affecting red cell antioxidant enzymes. Aim: The present study was conducted to assess the impact of oxidative stress (reduced glutathione) on glutathione peroxidase, and glutathione reductse and prevalence of anemia among diabetic patients. Materials and Methods: The study involved 100 adult patients attending Buraidah Central Hospital and 30 healthy controls. Blood samples were collected and analyzed for glutathione (GSH) concentration, glutathione peroxidase (GPO), glutathione reductase (GR), fasting blood sugar (RBS), hemoglobin (HGB), red cell count (RBCs) hematocrit (HCT) mean cell volume (MCV) mean cell hemoglobin (MCH) and mean cell hemoglobin concentration (MCHC) and hemoglobin A1c. Blood urea, serum creatinine, and microalbuminuria were measured to exclude diabetes mellitus nephropathy. Results : were obtained showed significant correlation between deficiency of glutathione peroxidase, glutathione reductase and deficient of glutathione among diabetics, which has significant correlation between low hemoglobin concentration (females <120 g/L, males <130 g/L), also there is low concentration of red cell count and red cell indices (MCV, MCH and MCHC). 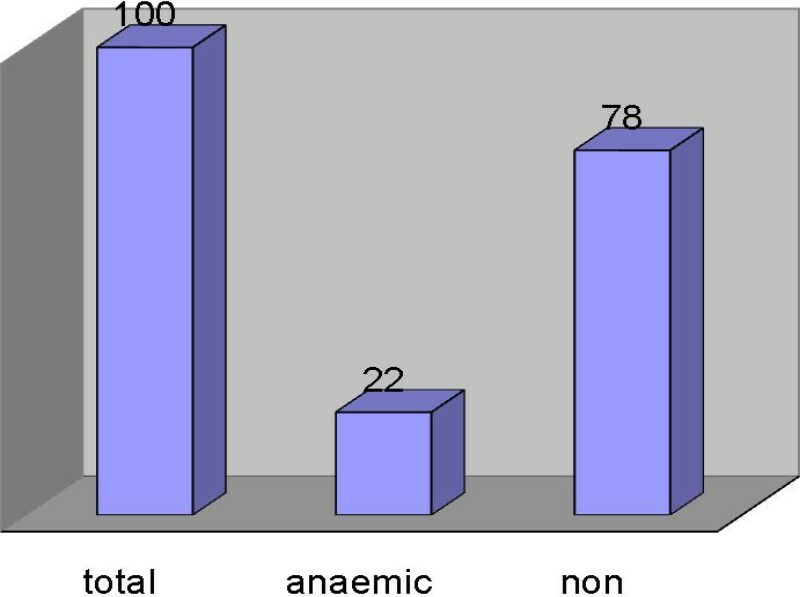 The prevalence of anemia was 22% in diabetes patients. Conclusion: It can be concluded that there is strong significant effect of oxidative stress (reduced glutathione) on glutathione peroxidase, glutathione reductase level these may reduce hemoglobin concentration in diabetic patients. This means oxidative stress of diabetes mellitus is the possible cause of anemia in diabetics without nephropathy.